I love that adding a blazer on top of basic boring clothing pieces magically pulls them all together and transforms the look from separate items into an “outfit”. Before this blazer I only owned black, grey & navy blazers and basically only wore them for work. I wanted to incorporate a fun blazer into my wardrobe for casual looks and this coral one fit the bill. I felt most comfortable wearing this blazer with other pieces that were neutral or lightly patterned because it is so bright and such an attention grabber. Looking at this group of pictures – I think I need to branch out into finding some fun dresses in my closet to wear with it! Award for most worn cardigan last year goes to my mint cardigan! It’s such a fun color for all seasons of the year. Looking at the review pictures – it looks like I mostly like pairing it with neutral patterns (black, white or navy) but there was also the occasional outfit using a yellow or green print. I purchased a cheap brown faux leather jacket from Forever 21 a few years ago (top right picture with black ruffle blouse) and found myself choosing to wear it much more frequently than my similar style moto F21 faux leather jacket that I already owned. The brown worked better for daytime casual outfits and over dresses because it was less hard/rocker looking. So when I came upon a really great fitting real leather jacket at a small boutique in Atlanta I decided to invest and I’m so glad that I did! With Florida having mild winters this is a great go-to jacket in the morning when it is chilly as I’m leaving the house but it will be 70 degrees by mid-day. It’s been a really great investment piece. I bought this polka dot blouse in March of 2013 because I already had a similar sleeveless polka dot top that I loved and was wearing all the time but I wanted something for work where I could take off cardigan and still have my arms covered. I found this blouse at Forever 21. 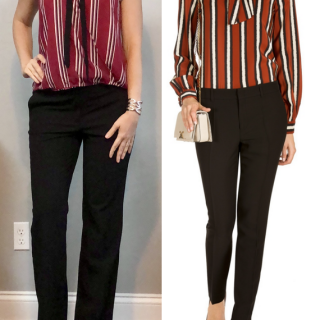 It’s such a fun top and a super great buy as a work wardrobe staple. This skirt was a impulse buy at Old Navy back in March. I already had a navy polka-dot pencil skirt in my closet so I thought I had my “navy patterned pencil skirt” category covered. But I randomly gabbed it to try on and ended up loving it. 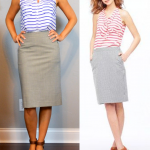 Unlike my structured navy pencil skirt – this skirt is soft and stretchy. It’s basically like wearing a tube sock. A very cute & flattering tube sock. Because of the soft stretchy fabric it seems a lot more casual to me then my other work pencil skirt. I usually think of pencil skirts as exclusively work-wear so I think the real bonus of this purchase was adding a casual pencil skirt option to my closet. I really like my floral pencil skirt. It has been a really great skirt because the colors do a good job of working for every season depending on the top & accessories. The skirt itself has pretty autumnal colors but when paired with a brighter white top, open toed shoes & silver accessories – I could still fit nicely for summer. And the dark tones are dark enough that I’ve even paired it with black sweaters, black tights and black boots in winter. Because I love this one so much – I think my next pencil skirt purchase might be a second brighter floral pencil for just spring & summer. Black pants. Everyone has them. While none of these outfits are especially creative or crazy it just shows that day in and day out those black work pants are the work horse and absolute foundation of a work wardrobe. They go with everything. You can wear them multiple times a week and nobody notices. They are dark so they hide stains & wear better then other pants. The are the single absolute must have work basic. I think finding an alternate to the little black dress really gives you a lot of additional wardrobe options. A dress with a color you love and not too many details (details that would pin it to a specific dressiness/event type) allows for the ability to dress it up or down using layers, shoes, scarves and jewelry. I love the vibrant pink color of this dress. I think this dress is wonderfully versatile purchase – I wore it with cute wedges to a baby shower, with fun heels on date night, with jean jacket and flat sandals for a casual look and in Thailand with sandals out to fun rooftop bars. Yay for fun punchy colored dresses that can be worn tons of ways! In April of 2013 a friend of mine invited me to a CAbi show for clothing at her house and I ended up buying a couple of things from her. (It was my first time going to an event like that.) When I tried to explain to my husband what a ‘house show for clothing’ is – he wasn’t getting how you can buy stuff from the consultant hosting the event until I compared it to Mary Kay or a Tupperware party. So now that it has arrived – he calls this dress my ‘Tupperware dress’ A shirt dress is such a easy but put-together thing to wear. I’m digging this one a lot so I think I’m going to keep my eye out for another one in a different color to add to my wardrobe. I love a good maxi dress. But looking through this group of photos it looks like like my wearing it ‘different ways’ really just means I add a cardigan, add a necklace or add a belt. But I love maxi’s so much – why ruin a good thing? I love a pretty print maxi dress as a go-to outfit for hot summer days. I first saw this dress on Audrey from Putting Me Together’s blog where she talked about how much she liked all the colors in this dress and options for pairing with colored cardigans & belts she already owns. I totally loved the dress and purchased the same one myself. It’s been a great investment so far this summer. I’ve worn it to two baby showers, a bbq and in Vegas I wore it all day with a jean jacket and, when my feet didn’t want to wear heels on the last night, out to dinner and drinks with the guys at Mandarin Oriental. 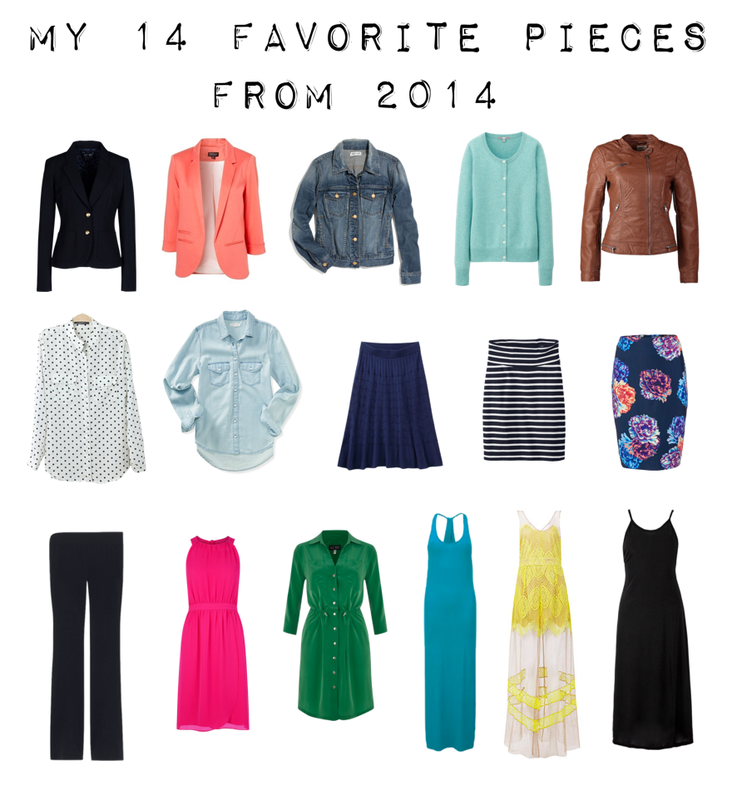 What a great post — I've been trying to move more towards a capsule wardrobe, so seeing your most worn pieces is really helpful.